Art Basel Miami Beach officially rolls into southern Florida on Dec. 1 this year, marking its 10th incarnation with more art and more flair than ever. When the show started in 2002, no one knew whether it would secure a place on the art circuit. But the jitters of planting a prestigious art fair in a place known mostly for beaches and bars faded within minutes of the V.I.P. opening. Collectors from all over the map showed up, and browsers and partiers soon followed. Now institutionalized — unskippable for many galleries and collectors — the Art Basel Miami Beach extravaganza transforms Miami's cultural world for one frenzied week annually. 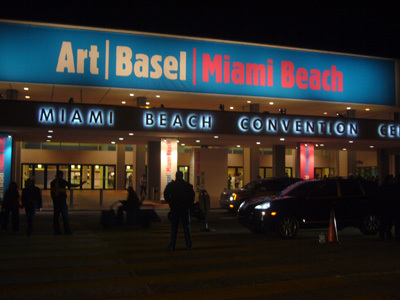 At the main event this year, in the convention center in South Beach, 205 galleries will exhibit, and "virtually all of them do some kind of dinner or cocktail reception on opening night," said Marc Spiegler, a co-director of Art Basel, the fair's organizer. Nearly 80 more galleries will take over smaller spaces devoted to brand-new art or themed exhibits. There are also satellite fairs, museum openings, private collection showings, outdoor exhibitions, performances on the beach, brunches, lunches, all-night parties — the list goes on. This year, the calendar features new items. For four nights, the New World Center, which was designed by Frank Gehry and opened in January, will present "Art Video" on a 7,000-square-foot outdoor projection wall. The outdoor "Art Public" exhibition, organized now with the Bass Museum of Art, has grown into a full-fledged sculpture park, with 20 pieces taking over a greensward that runs to the ocean. To celebrate the fair's 10th edition, Mr. Spiegler and his co-director Annette Schönholzer will hold a party on Thursday night, produced with Performa, which has engaged X-Patsys and the Joshua Light Show, among other artists, to perform. Keeping it a secret, restricted to the 1,000 or so who will fit into the undisclosed location, may be their biggest challenge. None of this happens without detailed plotting. "The art world has grown so big, so broad and so busy, and the art fair sector is almost like a subsidiary — it requires enormous effort by an enormous number of people," said Timothy Blum, an owner of the Blum & Poe gallery in Los Angeles, one of several participants who offered glimpses behind the scenes of Art Basel Miami Beach. THE BEGINNINGS On the morning of Dec. 6, less than 12 hours after the last drink was poured at the 2010 fair's closing party, Art Basel Miami Beach's staff gathered to review it and look ahead: what went right, what could be better. "Then we talk with everybody — dealers, institutions, everybody," Mr. Spiegler said. "We talked about what was most successful that year and what we'll be doing for the 10th edition. We're Swiss — everything has to be budgeted and workshopped, where someone goes away and focuses on transferring ideas into a concrete proposal." One idea that emerged was that "Art Video" projection wall at the New World Center. Dealers get more breathing room. Their applications to Art Basel Miami Beach are due in mid-March; selections, by a committee of dealers, take place in April, allowing them eight months to prepare. THE ART The David Zwirner Gallery, based in New York, participates in a dozen art fairs around the world every year, each with its own character. Art Basel Miami Beach is "more lighthearted," Mr. Zwirner said, so he shies away from showing just one artist, which he favors elsewhere. "We bring a variety of work." But what variety? The Zwirner staff meets quarterly to look nine months ahead and, as each fair nears, gathers for more specific meetings. "We want to do something different every year," Mr. Zwirner said. "We anchor the booth with things people have never seen." A gallery can't ask all of its artists to make something new for every fair, though. For guidance, he and his staff review "what did well last year." In December, for example, Steven A. Cohen, the hedge fund manager, made news when he paid $300,000 for a world map made of tin cans by Adel Abdessemed, who has been with the gallery since 2008. "We have a show on deck for him at the gallery next year, and that's the priority," Mr. Zwirner said, "but about three months ago, I asked him to make something for Miami. We suggested one work, and he suggested another, and we went back and forth." They agreed on a sculpture, made of razor wire, modeled on Mr. Abdessemed's own boots. Late last month, the gallery decided to gamble exclusively on sculpture for Miami Beach (except for some photographs on the booth's walls). Zwirner will take a work by Yutaka Sone, whose exhibit at the gallery closes this week, and something by Dan Flavin, whose estate Zwirner represents. Adding a little glamour, Mr. Zwirner also procured a piece by the minimalist master Donald Judd from a private collector. "We went to him, and we presented the idea — would he consign it specifically for the fair?" said Mr. Zwirner. Their program set, the gallery started e-mailing selected clients, "telling them in roundabout terms what we're bringing — a list of artists with one or two images to give them a taste," Mr. Zwirner said. "Often we get e-mails back asking about a certain work, and if there's an intent to buy, we might put it on reserve so people get the right of first refusal, with a time limit." THE STRATEGY By late August, Mr. Blum, of Blum & Poe, was working on his selections, too. "There's a maquette in the gallery, and certain things are being plugged into it," he said. By early October, the gallery had decided on its core display — works that give a taste of its coming exhibition of art made in Japan during the politically tense 1968-72 period, including something by Lee Ufan, a Zen minimalist whose first North American museum exhibition took place at the Guggenheim this summer. Blum & Poe says it does not consider pricing, despite signs that buyers are cautious for all but the best work. "It's more, 'Who makes the most sense for this fair?' We try to pull in artists who aren't getting as much attention as the majors," Mr. Blum said. "We avoid doing a 'greatest hits' booth." Mr. Blum also aims for an "intimacy" that's rarely associated with this fair. "We keep it spare; there are no screens, no special lighting," he said. "We remember the days when there was more time for people to look and hang out. So we make a very comfortable mini living room with chairs and a table. We want to get people hanging around in the stand, not just moving through." "This is a branding exercise," he explained. "I want to look as good as possible, and the commercial aspect comes next." THE PERIPHERY The Fairchild Tropical Botanic Garden in Coral Gables lies about 17 miles from the Miami Beach Convention Center, but it, too, plans for Art Basel Miami Beach. Since 2003, the garden has set the opening of its annual outdoor art exhibition to coincide with the fair. "There is a definite jump in admissions" as a result, said Nannette Zapata, the chief operating officer and art curator: 30 to 40 percent above normal attendance. This has not gone unnoticed in the gallery world. Some propose their artists to the garden. This year, "Will Ryman was pretty much a shoo-in," Ms. Zapata said. His dealer, Paul Kasmin Gallery in New York, had arranged last year's exhibition, for works by the husband-and-wife French sculptors François-Xavier and Claude Lalanne, and even before it went up, the gallery's directors had shown up at the Fairchild with renderings of the colossal pink and cherry red roses Mr. Ryman had planned to put on Park Avenue early this year. The Kasmin gallery also had an in. The art committee of Fairchild's board is headed by the collector Lin Lougheed. "When Lin first got involved with Fairchild, he reached out and let us know what he was doing there," said Hayden Dunbar, a director at Kasmin, "and that's how the dialogue started." Mr. Ryman is creating three new roses, in electric blue, vibrant yellow and fire engine red for the Fairchild, making 10 altogether. He will also scatter 25 oversized petals throughout the garden and place 15 ants and seven bees made of brass high up in Fairchild's trees. Mr. Ryman has visited Fairchild several times since December, most recently last month to work on placement. But the installation, which begins on Nov. 15 and is expected to take three days, will be the first time Ms. Zapata actually sees Mr. Ryman's works. "You bet I'll be there," she said. 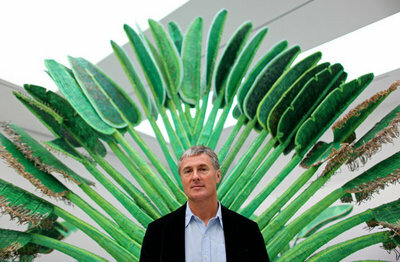 "I'll look at things from a curatorial perspective and a garden perspective, like where the sun hits things. It's one of the fun things I do." THE EVENTS On a late September trip to the United States from Basel, where he lives, Mr. Spiegler was visiting dealers and collectors, and still working on the fair's events. Over breakfast in Manhattan's Chelsea neighborhood, Mr. Spiegler dabbed at his fresh fruit plate and said he couldn't discuss that secret, special celebration, because everyone would want to attend. He changed the subject to the prefair party at the W South Beach hotel. "This is the fresh-off-the-plane party," Mr. Spiegler said. "The fall is tough for the art world. There are two major shows in Europe, all their seasonal openings, September exhibitions ... so you want to welcome them. We wanted to do something that wasn't just cocktails." Kreemart, a company that treats art as nourishment, was his answer. "We give the medium of dessert to the artist," said Raphael Castoriano, a founder. "They create work using only sweets." The art is both performance and sustenance. "Sometimes, it involves eating something off someone's body," Mr. Spiegler said. "We are going to have at least five artists," Mr. Castoriano said. Ryan McNamara, who often makes a lavishly frosted cake part of his work, and Maria Jose Arjona, who has made a dress of candy that she gives away during the event, have agreed. So have Angel Otero, who makes a model of the Manneken Pis statue in Brussels for chocolate to flow through, and Regina Silveira, who will recreate a cookie she made in 1976 called "Biscoito Arte." Mr. Castoriano said that while he had asked others, including Terence Koh and Shirin Neshat, he was unsure who would participate. "Artists change their minds," he said, not at all disturbed: "It's a happening, so we don't know what's going to happen." Surprise is part of the fun, even for the fair's organizers. When Mr. Spiegler and Ms. Schönholzer arrive for the V.I.P. opening, this year on Nov. 30, "it's like Christmas for us," he said.